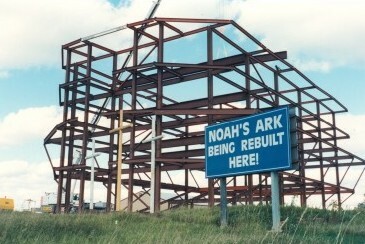 The Ark itself is being constructed to the dimensions of Noah’s original Ark. It will be 450 feet long, 75 feet wide, and 45 feet high. That’s over a football field and a half long and three stories high! The Ark will be built in three phases. Each phase involves erecting and enclosing one third of the Ark. The steel superstructure for Phase I is in place. The next step is to completely enclose and finish Phase I.